Treasures of Egypt Tours is pleased to announce a new partnership with Pyramids Overlook Inn, a tiny three-room inn with a big view! 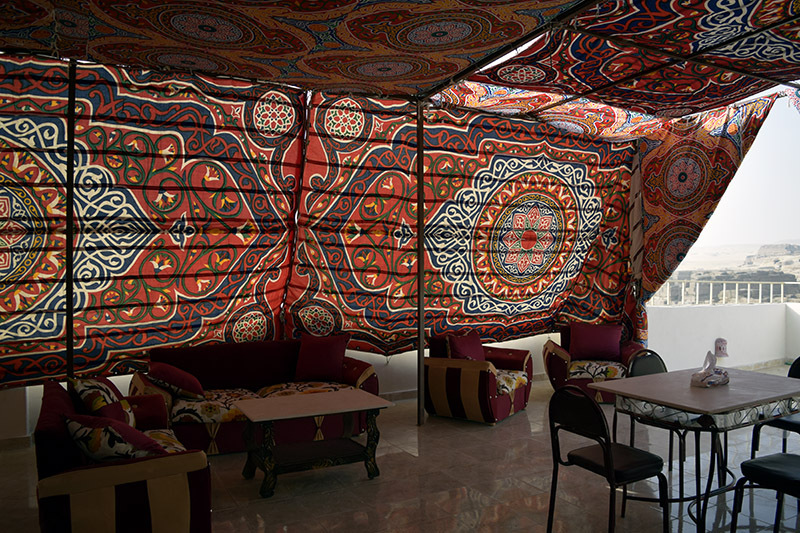 Aside from the astounding location and views, the most impressive feature of the Inn is the large Bedouin-inspired rooftop terrace, where visitors will be enchanted to soak in the views, play a game of Backgammon or Chess, enjoy a meal or a cup of tea, and watch the evening Sound and Light Show. The Inn is open and ready to receive up to 8 guests in three rooms: two triple rooms (each with three single beds), and a double room with a Queen bed. Of course, breakfast and evening hot drinks are included with every stay, and the gorgeous view is sure to please!